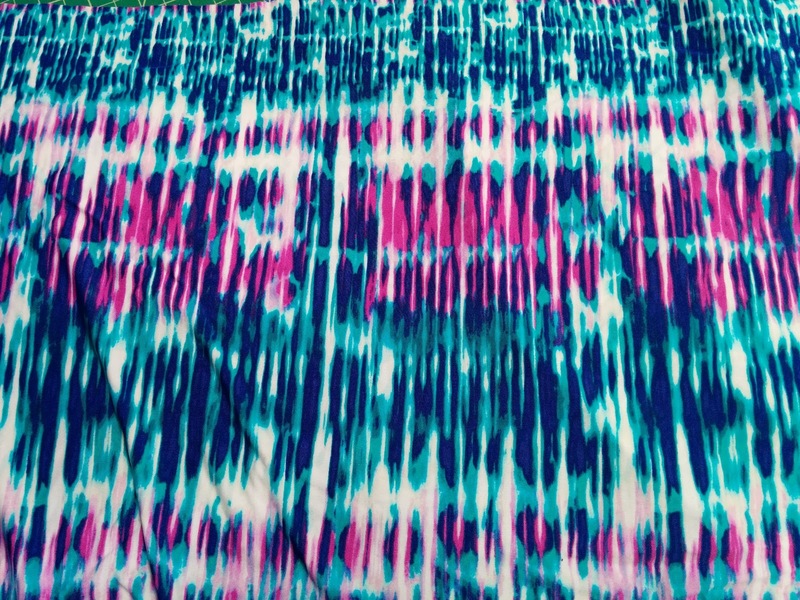 Clothing Hacker: My new rhythm dress! This post has been a long time coming. I mentioned a few times in the past that I wanted to put together a rhythm dress. Well, I put one together and wore it to my last dance competition. 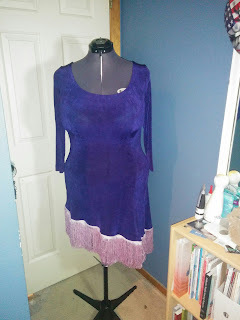 This project all started with a dress made from a gorgeous purple slinky knit that I found in a thrift shop in Laguna Beach for $5. Then I cut the bottom of the dress off asymmetrically. 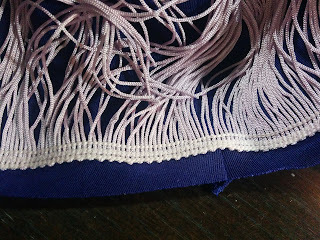 I purchased some 6" lilac chainette fringe. 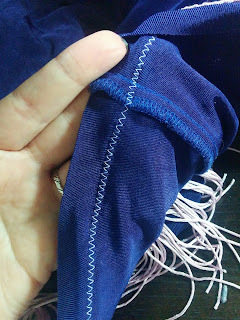 I sewed a row on upside down about 1/2" from the cut edge along the bottom edge of the dress with a zigzag stitch, right sides together. 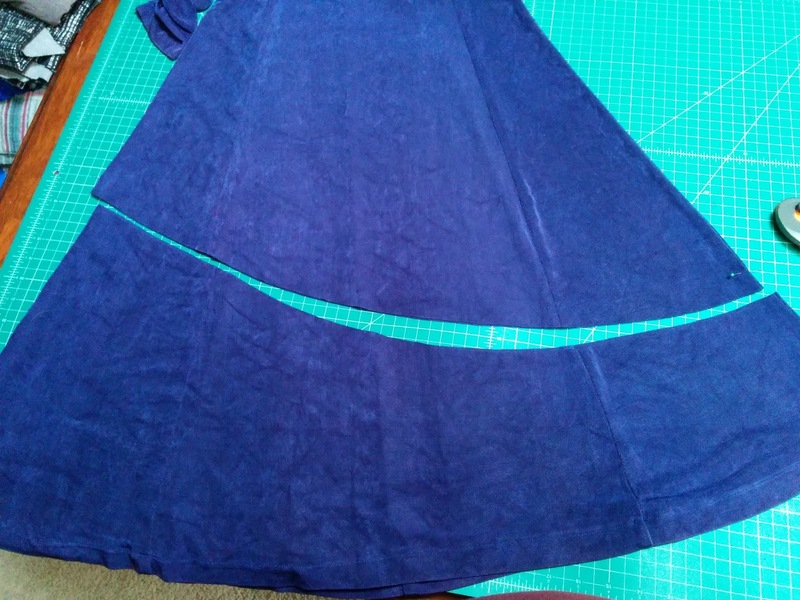 I turned the edge under under to create the hem and then sewed a second row of the fringe just above the hemline, but close enough that I caught the turned up edge of the dress hold it in place. 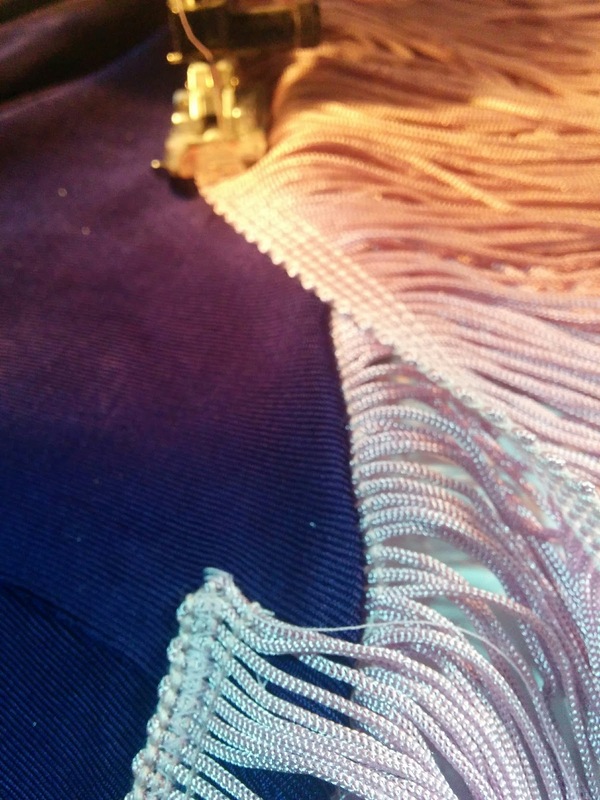 So I ended up with two rows of fringe along the bottom of the dress, so it looks nice and full. 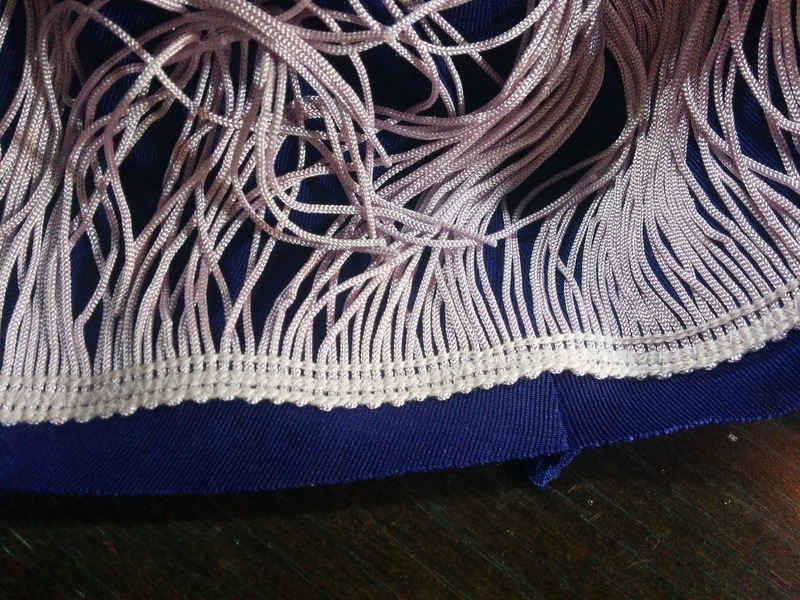 The fringe doesn't stretch, so I was a bit concerned that the stitching might end up popping, but that part of the dress doesn't end up getting stretched out and since it's applied on an angle, there hasn't been a problem yet. For this to be a "proper" dance dress, it needs to have a built-in leotard. 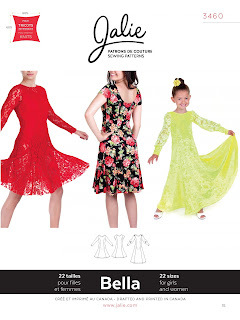 In comes Jalie Bella fit and flare dress pattern. The dress in this pattern is basically the same as the one I purchased -- an armhole princess seamed fit and flare dress, but it has an optional leotard underneath. 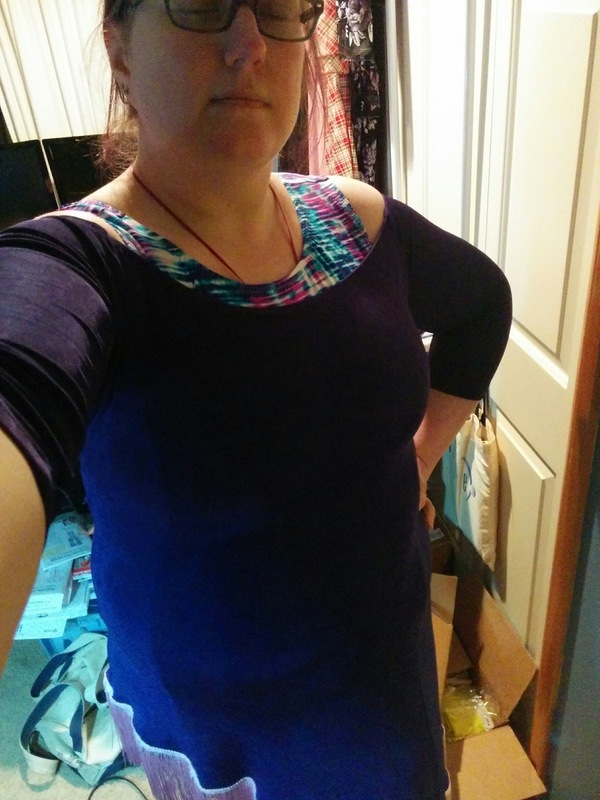 I made what was basically a muslin of the leotard in a blue nylon/lycra activewear knit that I had in my stash. According to the pattern measurements, I needed to add 2" to the length and that was the only alteration I did to the pattern. It fit perfectly, so I made it again in this swimwear knit that I purchased from Pacific Fabrics because it matched both the purple of the dress body and the lilac of the fringe. I used the blue muslin leotard as a lining to this leotard. 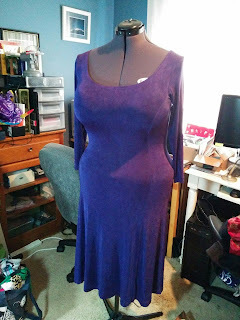 After trying them on together to see how it looked, I decided that I would like to open up the neckline more and make the purple dress sit off my shoulders and show off a little skin and a little more of the leotard fabric. I also have discovered that, even though these dresses have a lot of stretch in them, I don't want to pull them up over my head because I'll end up messing up my hair and makeup that I sat and had done so beautifully by the wonderful professionals at these events. I designed my green Modern Nature smooth dance dress to pull on like a swimsuit, but the neckline ended up getting pretty stretched out after I decorated it with the rhinestones and pull it on that way a dozen or so times. 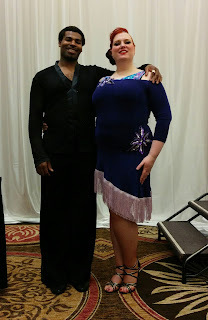 So I've decided that I need to add zippers to my ballroom dresses from now on. So, I ripped open the back seam of the dress and added an invisible zipper. The dress and the leotard are joined at the zipper and I also sewed them together along the front where the purple dress comes straight across the front of the leotard. 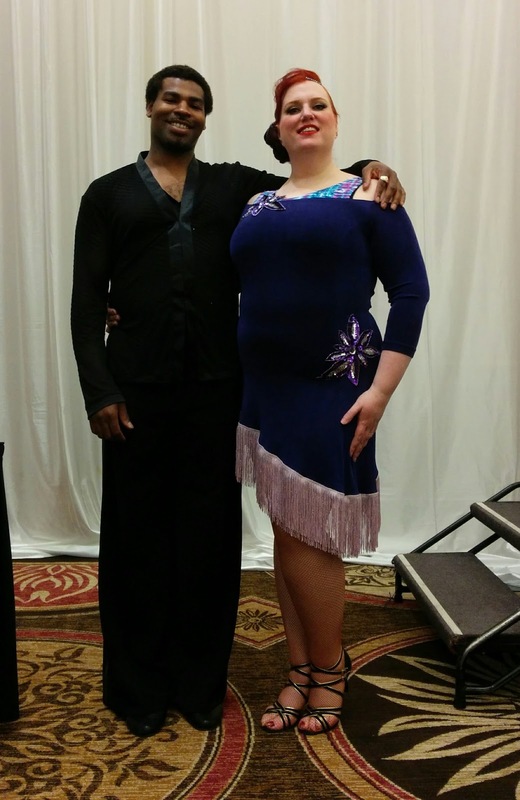 Here's a photo of me and my instructor Yaunique at the Portland DanceORama. I have purchased some rhinestones and plan on decorating my new rhythm dress soon. I really like the way it looks now and I'm a little afraid that adding the rhinestones will detract from the simple beauty of the dress. But I also really want a super sparkly dress to wear too! I love this dress on you, you look amazing in it! 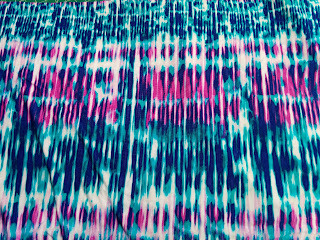 I think I need to take up dance just so I have an excuse to add fringed bottoms to everything, haha. Thank you so much! You should take up dance! It's great exercise, is so much fun and has done a lot for my self esteem and social skills. And getting to wear all the pretty dresses doesn't hurt! I also just realized that I forgot to add a link to one of my videos in this post. Haha. I'll have to edit it in a bit. I saw your dress on the Curvy Sewing page and had to come over to see how you did it. It looks wonderful and great on you, I love how the fringe shimmers as you dance. Beautiful! Thank you so much! I love the way the fringe feels when I move too. I've decided that I need to figure out an excuse to put fringe on everything I wear! Fabulous dress and even more fabulous dancing!! Thank you. I love dancing so much. I've come a long way, but every time I go to these events (or watch Dancing With The Stars) I get so inspired to push myself to get to that next level. It's awe inspiring to be around so much glitz and glitter and amazing talent. And seeing the gorgeous dresses and then seeing the price tag is what brought me back into sewing a few years ago!